While green roofs have a history nearly as old as civilized society, they've recently experienced a sudden surge in popularity that parallels the sustainable design movement as a whole. Not to be confused with the rooftop garden (which is simply plants potted in containers or raised beds, unattached to the infrastructure of the design), a green roof, also known as a living roof or sod roof, is a flat, sloped rooftop supporting vegetation through systems of irrigation, drainage, and waterproofing to help cut the costs of home heating and cooling. The trend is rapidly growing in metropolitan areas, while countries around the world are encouraging the movement by offering tax abatements, education, and infrastructure support for those who want to integrate living roofs into their private homes, public institutions, and even corporate high rises. With a mind for ecological stability, architects are revisiting the concept and trailblazing a path toward making our buildings come to life. The first record of green roofing appeared four thousand years ago in the Hanging Gardens of Babylon, one of the seven wonders of the ancient world; though there is no archeological evidence of the gardens, ancient Greek, Roman and Assyrian texts refer to the gardens, implying that the idea of the green roof has always been planted firmly in the collective mind. According to these texts, the Babylonians installed stone terraces with gardens atop their buildings, fitting them with the same indigenous trees and other fauna that dotted the mountainous skyline of Babylon. 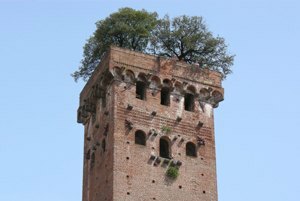 If the texts are accurate, the Hanging Gardens provided cool shade for the population while helping to cool the inside of the buildings. 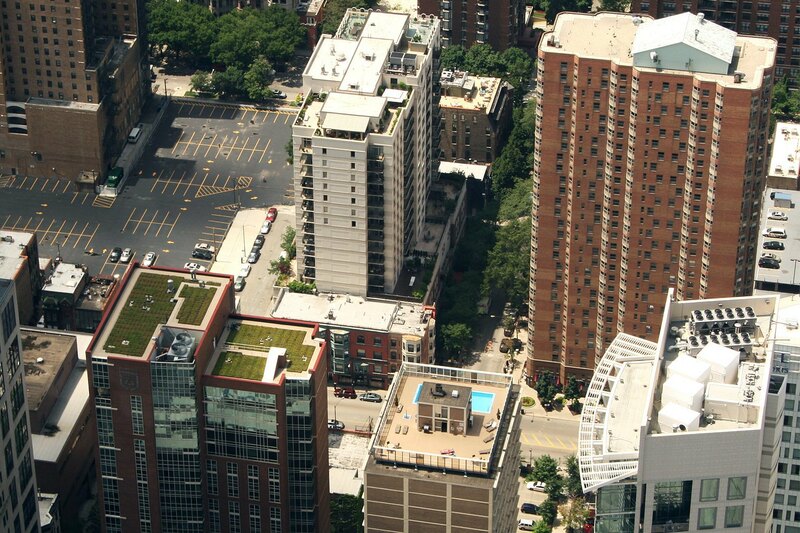 Green roofs have also been used as a survival tool in extreme climates. During the Norse era, Viking longhouses were fitted with sod roofs that included substrates and water-retaining membranes made out of birch wood. The Vikings locally sourced their plants and sod to create sturdy structures they knew would survive the harsh winters while also fully insulating the structure from the cold. In fact, three hundred years later archeologists are still finding remnants of these houses, indicating the incredible durability of the design. The Faroe Islands continue to maintain the verdant tradition of its original Viking settlers, hosting the largest collection of green roofs in the world. An archipelago located halfway between Scotland and Iceland, the Islands experience an average of 300 rainy days a year; green roofs offered a pragmatic solution to the exceptionally sodden environment, with Islanders adapting to the natural environment, instead of the modern idea of repelling or rejecting it. 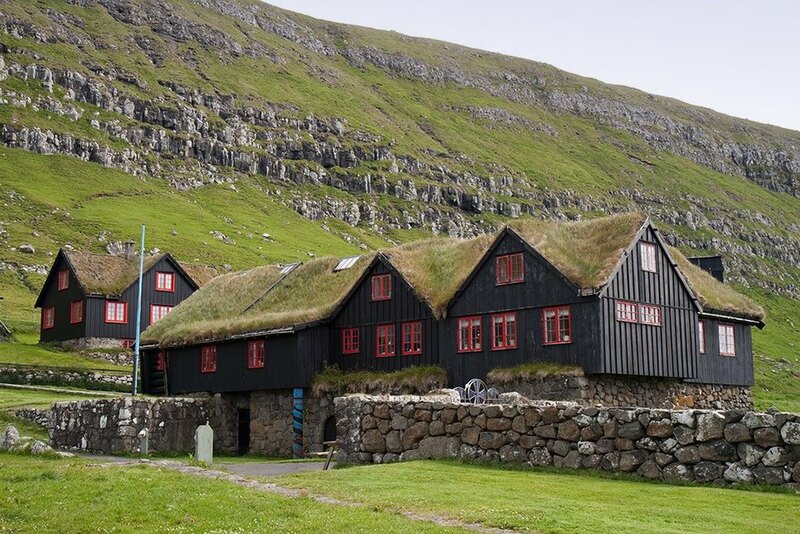 Today, green roofs are the idiosyncratic symbol of the Faroe Islands, used by private homes and municipal buildings alike. Contemporary green-roofing technology began during the mid-twentieth century in Germany, when Gerda Gollwitzer and Werner Wirsing published Roof Areas Inhabited, Viable and Covered by Vegetation. The book investigated the different components of living roofs—including root repelling agents, waterproofing membranes, drainage and the weights of different soils and plants—to find a viable, cost-effective plan for implementing living roofs. The movement got a bold endorsement by the German government when it sponsored the implementation of a green roof at the headquarters of GENO, a Stuttgart-based gas and electric company, in 1969. According to architecture and design theorist Christian Werthmann, modern environmentally-conscious design was firmly supported by the German public from its inception, with green roofs being recognized for "not only the prospect of ecological benefits but the deep aesthetic discontent with the status quo of the built environment." With environmental awareness spreading across the population throughout the rest of the 1970s into the 1980s, Germany committed to researching the benefits of the green roof, ultimately recognizing that pursuing the concept on a largescale could "help them better manage storm water, curb flooding, and combined sewer overflows." Germany has become a model for the implementation of both the infrastructure of and policy surrounding living roof design. In the thirty years following the public’s initial interest in sustainable architecture, German-led bioengineering has developed lightweight, inexpensive, and easily-maintained living roof systems, and over 40 municipalities throughout the country have laws that either require or encourage green roof construction. In Berlin, green roofs are legally required for buildings on large construction projects. "The green roof industry grew into a $540 million per year enterprise—seven percent of the German roof industry," Werthmann notes. Given its early roots in the northern parts of Europe, it comes as no surprise that living roofs have sprouted across the continent. "Rainwater runoff capture requirements have been in place for a long time in places like the Netherlands and other European nations below sea level," a green roofing professional from Recover Green Roofs tells Hopes&Fears. "We’ve seen a trend of more and more municipal bodies developing and growing sustainable technology." 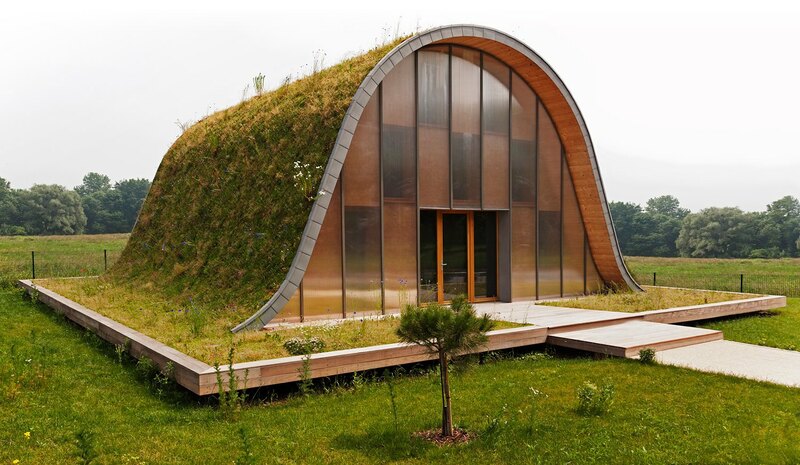 One of the most innovative and cost-efficient designs for green roofing is La Maison-vague (which translates to "the wave house") in Reimes, France. Built and designed in 2011 by French architect Patrick Nadeau, La Maison-vague was an experimental project for the public housing council of Reims in hopes of creating a cost-effective concept for a subdivision requiring 63 units built on the predictably tight budget of government-sponsored housing. Instead of the monotonous and often apathetic design usually reserved for subsidized housing, Nadeau used economic constraint as an asset by not only using affordable-yet-sustainable materials, but by also making a home that adapts to its enironment because of its living exterior, which provides thermal insulation. Besides its concrete base, the house is made entirely from natural materials such as wood, soil and vegetation. In his statement on the design, Nadeau says, "The house is alive, changing its appearance, color and odor with the seasons," especially as new flora brought by wind and insects pollinates the exterior. Nadeau sits at the forefront of the living roof movement in France; in fact, just this May, the French government passed new legislation requiring that all new commercial zones and buildings be at least partially covered by either green roofs or solar panels. In Denmark, the green roof culture is not just limited to the historical Faroe Islands; as of 2010, the capital of Copenhagen became the first Scandanavian city to create a mandatory green roof policy, requiring all newly-built roofs, both public and private, to be vegetated. So it's no surprise that Danish architecture firm Bjarke Ingels Group (BIG) has been a trailblazer for the movement, integrating living infrastructure in architecture both in Denmark and in its projects around the world. Lead architect Bjarke Ingels uses green roofs as part of an architectural philosophy he calls "hedonistic sustainability," an approach in design that doesn't see sustainability as a limiting policy, but instead as something that can improve quality of life for both people and their surrounding environment. "The whole discussion about sustainability isn't popular because it's always presented as a downgrade," Ingels says in an interview with the American Society of Landscape Architects. "The position has been there's a limit to how good a time we can have. We have to downgrade our current lifestyle to achieve something that is sustainable." Ingels instead sees sustainability as a design challenge, showcasing the possibilities that working with the environment can offer. Take for instance the Danish National Maritime Museum, which is so well integrated with its surroundings that you might not even realize that you are stepping on to its green roof at all. 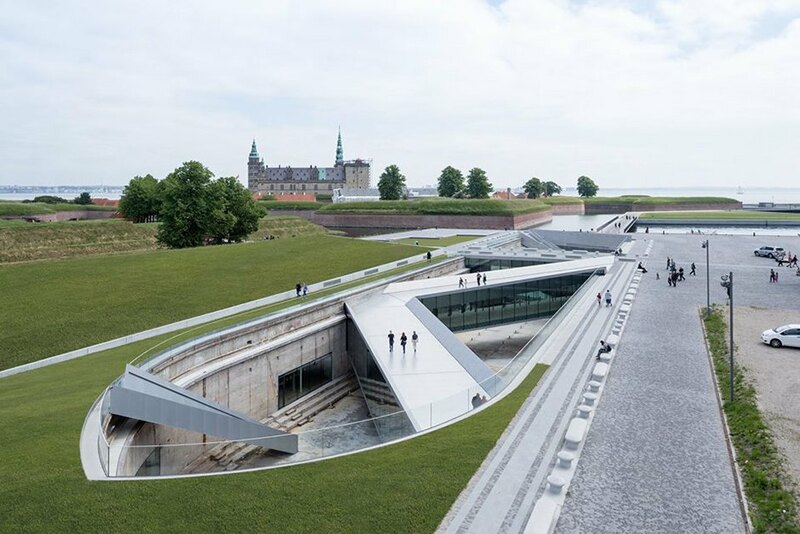 That’s because the entire museum is built underground as part of a dock, a choice proposed by BIG in order to keep from obscuring the view of one Denmark's most famous buildings, the Kronborg Castle. Because it is both below sea level and by the shore, the living roof's grass and soil actually help keep the museum in place while also allowing visitors stroll along the shoreline uninterrupted. Located just 100km from the Arctic Circle, one would expect that a home in the Skakafjördur Fjord of Iceland would rack up electricity and heating costs at an astronomical rate. The Hof residence, which impliments a living roof as part of a wholly-natural energy system, proves otherwise. Designed by Studio Granda, The Hof Residence looks as if it emerges straight up through the ground—and it basically did. Instead of replacing, grass, soil, and rock from the worksite with outside supplies, the architects refitted the structure using the excavated materials. 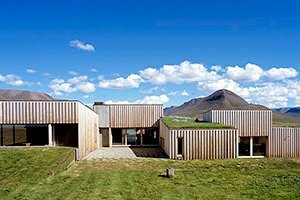 The displaced grass and soil were installed on the Hof Residence's roof, insulating the building from the harsh Arctic weather; because the architects sourced the plants and soil locally, they are already adapted to Iceland's extreme climate, creating strong insulation while requiring virtually no maintenance. And with geothermal water used for floor heating and radiators, electricity use is reduced to almost nothing. While sustainable architecture may seem as a newer idea in the United States, one of the oldest urban living roofs was constructed way back in 1934 right in the middle of New York City, on the seventh floor of Rockefeller Center. The gardens were certainly a visionary concept that peeked into the future of the living roof in New York; nearly a century later, NYC now provides property tax abatement for building owners who install living roof systems, citing benefits such as minimizing run-off that pollutes waterways, increased roof longevity, and a reduction of the heat-island effect that makes cities hotter than suburban and rural areas. "Green roofs will become more integrated into the urban fabric of our cities and thereby perform even more types of roles," John Donnelly, senior associate at SCAPE Architecture, tells Hopes&Fears. "Today in New York and other major cities, many public spaces are constructed on top of structures, creating multi-layered, functional building systems that incorporate green plants, soil systems, and ecological functioning." The Brooklyn Academy of Music is a prime example, serving as one of ten NYC cultural institutions currently participating in a pilot program to explore sustainable construction and design. BAM's recently-completed Fisher Building has a living roof that is fully-integrated into the infrastructure of the design which not only efficiently cools the building's interior, but also uses a rainwater harvesting system that stores water for irrigation and building sewage conveyance. 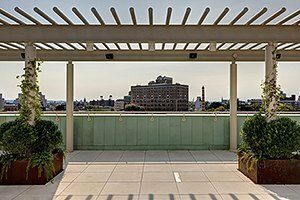 Just as Donnelly suggests, BAM conceived the living roof with community gathering in mind; BAM President Karen Brooks Hopkins says, "It was critical for BAM to create a building where we can thrive artistically and give back to our Brooklyn community in ways that feel uniquely BAM." "[A green roof] is a really crowd pleasing feature and I think a lot of property developers understand that green roofs are beneficial from a number of angles," says our source at Recover Green Roofs, "there is a social element and I think developers understand they have the opportunity to provide amenities above grade." 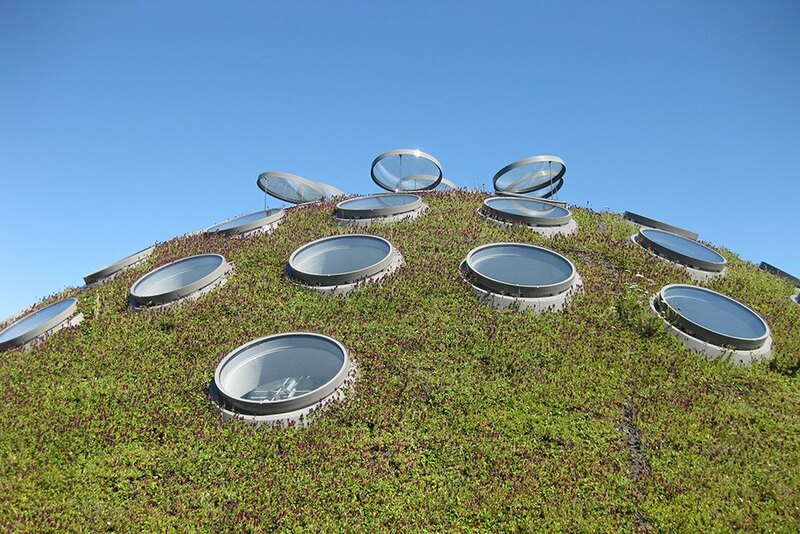 In this regard the green roof at the California Academy of the Sciences shines bright, with 2.5 acres covered in 1.7 million California native plants, right in the heart of San Francisco's Golden Gate Park. The roof fosters local wildlife, insects, and flowers that Academy scientists can cultivate for research in one of the building's eight research facilities. In addition to an indoor rainforest and a coral reef exhibit, the Academy also houses the Morrison Planetarium, Kimball Natural History Museum and Steinhart Aquarium, making the facility a viable ecosystem from floor to rooftop. Due to its design, the roof also withholds 100% of excess rainwater, preventing runoff from carrying pollutants into the ecosystem. Ultimately, all of the R&D that has gone into integrated green roof design trickles down to the consumer level, with new affordable technologies allowing anyone to join the movement. "The technology keeps progressing and becoming more and more accessible," our sources explains, "the evolution of sustainable technology has pushed green roof components into smaller packages and more nuanced assemblies." As the benefits and ease of green roof installation become more apparent, the opportunity to create greener, more sustainable living spaces is sure to grow.